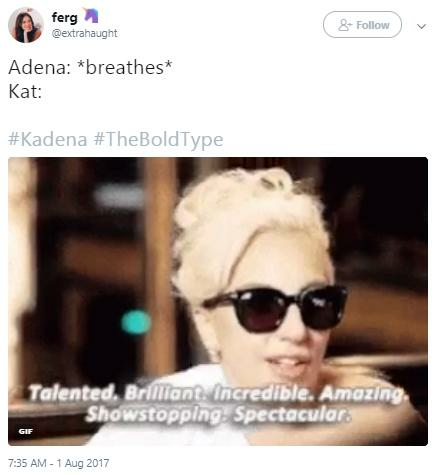 Kat and Adena 4 eva. If you're not officially on the Bold Type train yet, let me tell you why you should be. Despite being a new show, The Bold Type has something GREAT working in its favor. They have managed to write one of the most engaging and emotional LGBT storylines we've seen in a while starring two women of colour (!!). 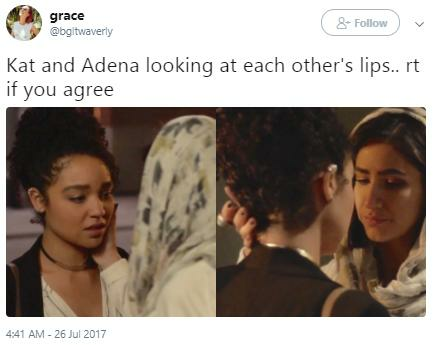 Kat (Aisha Dee), a social media director at 'Scarlet' magazine comes to realise that she's not "strictly dickly" after becoming deeply infatuated with Adena (Nikohl Boosheri), a Muslim activist/artist. 'Why is this so important', you ask? Considering that Hollywood is complicit in both LGBT and Muslim erasure, this divine pairing is a big win for representation. Kat's character development involves teaching moments that reflect how nuanced sexuality can be. Similarly, Adena's own sexuality and relationship with authority expose some real and complex issues that many people across the world are currently experiencing. What's even more interesting about their pairing is that their relationship isn't implied. Often times LGBTQ characters on TV are given a partner who they occasionally kiss but who audiences never see in more than a one dimensional light. With Kat and Adena, everything from their flirtationship, sexts, and eventual first kiss play out alongside the heterosexual love stories on the show. Kat and Adena don't have a "convenient" love story either. Their characters are given the chance to struggle and fight for their new romance, something which isn't just handed to them for the sake of having a "gay storyline". Audiences are LIVING for #Kadena and it's clear this representation matters. It's still early days for The Bold Type, but the fact that viewers get to see a black woman and a Muslim woman have a romantic relationship on TV is huge. It's fundamental that we are elevating and evolving fictional narratives to reflect what love actually looks like in 2017. 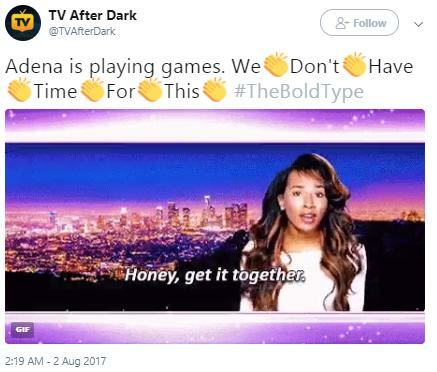 On The Bold Type Kat and Adena's relationship is not without context. Love does not exist in a vacuum and their nuanced love story proves just that.